Eur J Pain. 2018 Apr;22(4):700-706. 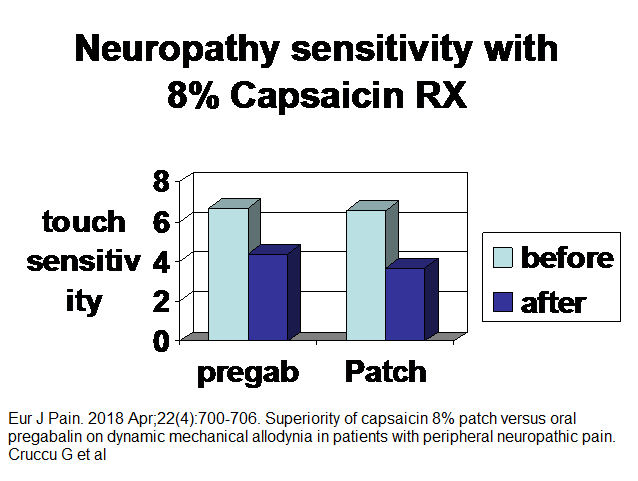 Superiority of capsaicin 8% patch versus oral pregabalin on dynamic mechanical allodynia in patients with peripheral neuropathic pain. Complete resolution of pain in 24.1% of patches and 12.3% of pregabalin at 8 weeks side effects were pain and eythema at time of treatment but were manageable. Groninger H, Schisler RE. Topical Capsaicin for Neuropathic Pain #255. Journal of Palliative Medicine. 2012;15(8):946-947. doi:10.1089/jpm.2012.9571. 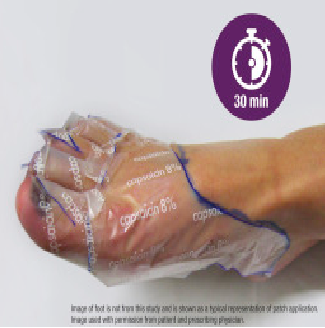 This entry was posted in neuropathic, Topical Pain Treatments. Bookmark the permalink.